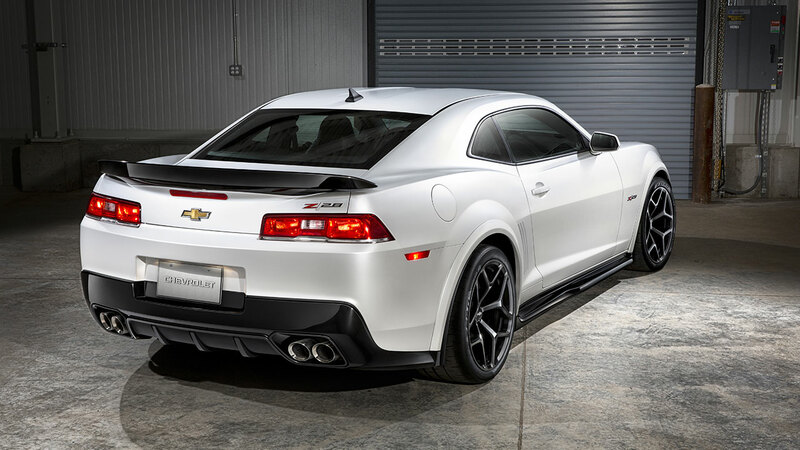 The 2014 Camaro models feature a revised exterior design that integrates high-performance aerodynamics for more efficient cooling and stability at high speeds. The new Camaro Z/28 also features a full aerodynamics package that creates downforce at speed, which helps make it the most track-capable offering in Camaro’s history. The first Camaro Z/28 was introduced in 1967, created to compete in the Sports Car Club of America's Trans-Am 2 class. It featured a smaller, lighter, 302-cubic-inch V-8 for improved weight balance, as well as quick-ratio steering and a heavy-duty suspension for track use. In keeping with its road-racing focus, the 1967 Camaro Z/28 was not available with an automatic transmission or air conditioning. The new 2014 Camaro line will arrive at Chevrolet dealers later in 2013. The Camaro Z/28 is expected to be appearing at track events across the United States in spring 2014. The 2014 Camaro represents the most significant redesign since the introduction of the fifth-generation Camaro as a concept car in 2006. Compared to the previous model, the design represents a strong visual change front and rear, resulting in a wider, lower, more contemporary appearance. The front fascia features a wider lower opening, and a narrower upper opening that also updates the appearance of the iconic “halo ring” HID headlamps on the Camaro RS package. 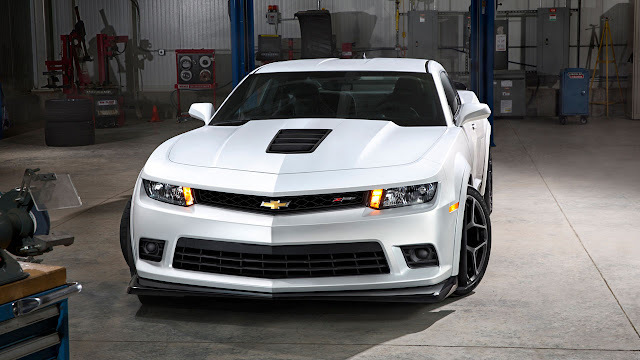 The functional hood vent on the Camaro SS helps reduce heat and aerodynamic lift. Moving to the rear, the sculptural decklid, horizontal lamps and diffuser complete the powerful statement. The Camaro Z/28 also features a full aerodynamic package designed to produce downforce at track speeds. At the front, the Z/28 features a large splitter, connected to an underbody panel that further reduces lift. In profile, the Z/28 features fender flares over the front and rear wheels, as well as extended rocker panels that contribute to aerodynamic stability. An aggressive rear spoiler and functional diffuser complete the aerodynamic package. 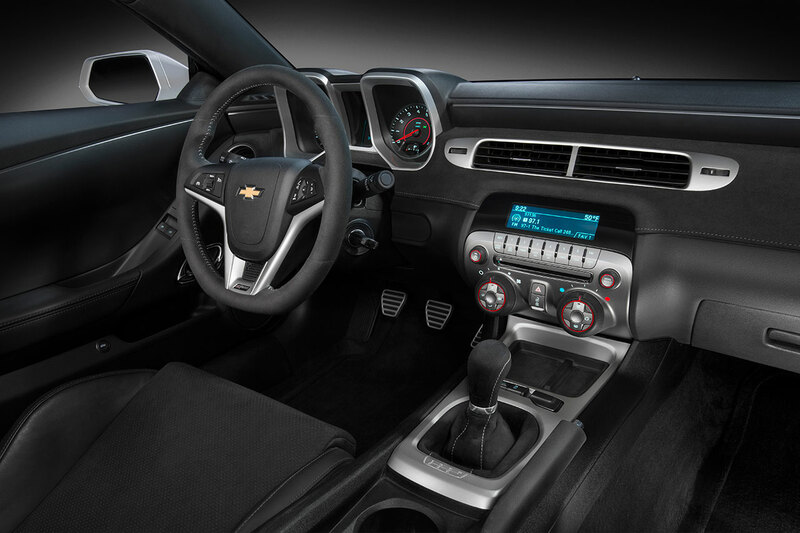 On the interior, the Camaro Z/28 features trim in a distinctive, matte-metallic finish named Octane, the ZL1 flat-bottomed steering wheel, and standard Recaro seats with microfiber suede inserts. 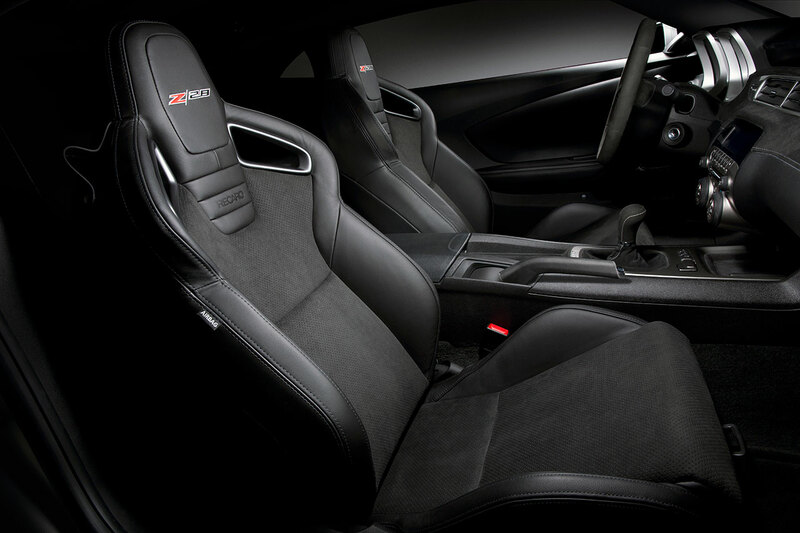 The new seats (also available on the coupe versions of the SS and ZL1 models), feature aggressive bolsters for high-performance driving, as well as seat cutouts inspired by the five-point harnesses found on racing seats. To save weight, both front seats incorporate manual adjustment. The rear seats of the Z/28 have also been modified for weight reduction. A total of nine pounds (four kilograms) was saved by eliminating the seat-back pass through, as well as using high-density foam in place of the rigid structure of the seat back and steel mesh of the seat bottom. Like the original, the new Camaro Z/28 forgoes ultimate horsepower and torque for improved weight balance and track performance. In 1967, the most-powerful engine available in a factory Camaro was a 396 cid V-8 with 375 horsepower. To prepare the Camaro Z/28 for road racing, engineers specified a lighter, 302 cid V-8, officially rated at 290 horsepower. While the 302 was not the choice for drag racers, it proved ideal for sports-car racing. Today, the most-powerful engine offered is the Camaro ZL1’s supercharged 6.2L LSA, which delivers 580 horsepower. 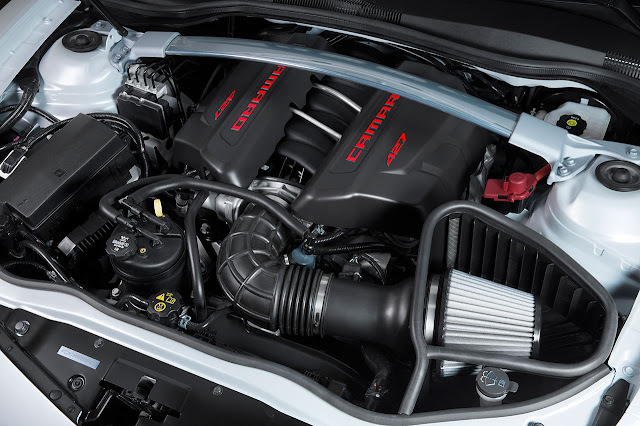 The heart of the 2014 Camaro Z/28 is the lighter, naturally aspirated 7.0L LS7 first introduced in the Corvette Z06. 11.0:1 compression ratio, and a 7,000 rpm redline. For the Camaro Z/28, the LS7 features unique induction and exhaust systems, and delivers at least 500 horsepower (373 kW) and 470 lb-ft of torque (637 Nm). The racing-style, cold-air induction system and large K&N air filter provide maximum air flow. The standard dual mode exhaust system and larger-diameter pipes enable improved air flow. By bypassing the mufflers during acceleration, the system increases both the torque and sound generated by the LS7 engine. The Camaro Z/28 is exclusively offered with a Tremec TR6060 manual transmission. The six-speed features close-ratio gearing and 3.91:1 final drive ratio, both optimized for the power characteristics of the LS7. Power is distributed to the rear wheels via a limited-slip differential featuring a helical gear set, rather than traditional clutch packs. The new design enables the driver to apply more power and get through corners faster, by continuously adjusting the torque bias to maximize available traction. Unlike some competitors’ “track package” offerings, the Camaro Z/28 makes standard all the cooling systems required for track use. This includes the dry-sump oiling system for the LS7, which is connected to an integral liquid-to-liquid cooling system for engine oil. A second liquid-to-liquid system provides cooling for the transmission and differential. This system pumps overcooled transmission fluid to a heat exchanger in the rear differential before traveling to the transmission. This reduces differential temperatures as much as 100 degrees F.
The singular focus of the Camaro Z/28 is most evident in the chassis, where the most has been made of every component for track use, from the ultra-high performance tires to race-proven dampers. The Camaro Z/28 is the one of the first production cars fitted with race-proven, spool-valve dampers. Compared to a conventional damper that offers only two-way tuning for bump and rebound, a spool-valve damper allows four-way adjustment to precisely tune both bump and rebound settings for high-speed and low-speed wheel motions. The wider tuning range allowed engineers to dramatically increase the damper stiffness on the Camaro Z/28 without a significant change in ride quality. Additional chassis changes include stiffer string rates and suspension bushings for improved cornering response. 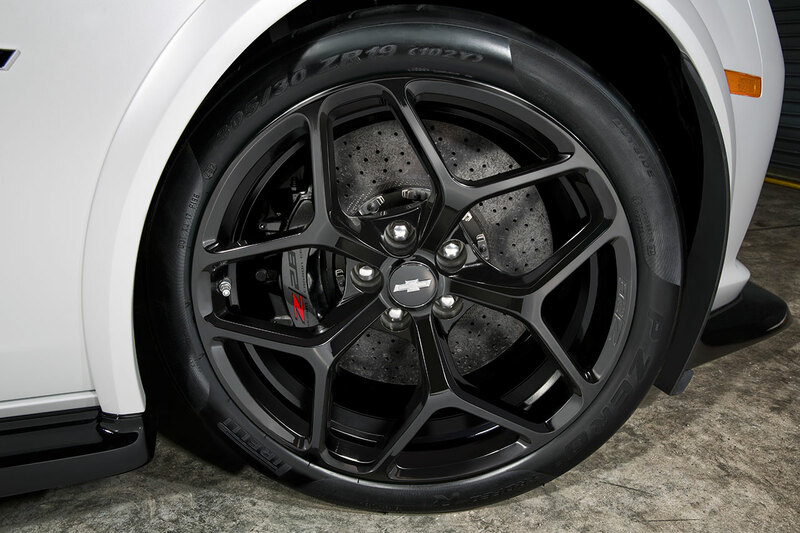 The combination of tire grip and braking power enable the Camaro Z/28 to achieve up to 1.5 g in deceleration. With standard front brake cooling ducts, the Z/28 is also capable of continuous track use unmatched brake feel, lap after lap.